No, we don’t think this is an actual thing. Probably. According to a Phillippine news site, the “chief exorcist of the Phillippines” is warning the public that Satanists affiliated with the Illuminati have cursed rosaries and distributed them to the public, thereby cursing the owners and even the priests to whom they’re brought. And lest this be automatically considered “fake news,” this story originated by a claim made by “Father” Ambrosio Nonato Legaspi on Novaliches’ Radio Veritas show Hello Father 911. You can also read about it at this Roman Catholic news site. The priest claimed the rosaries were being given away by Satanists, and it was a scheme of the Iluminati. He claims the rosaries have been “prayed over” and make the owner especially susceptible to demonic possession. “These were made not only to be simply given away but to deceive Catholics…so that evil spirits will haunt them,” Legaspi added. What should the public do if they believe their rosary has been cursed by Illuminati-affiliated Satanists? According to the priest, they need to be exorcised by a professional, and not merely “blessed” at the local parish. 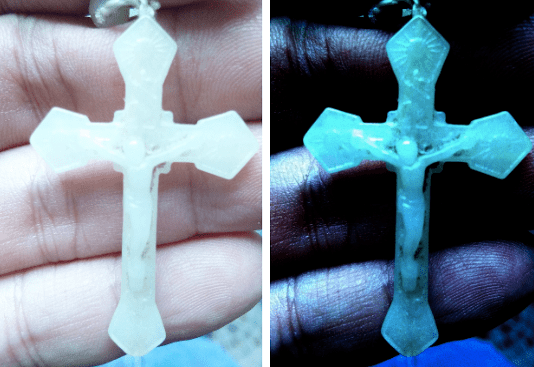 Reports are now circulating that all over the Phillippines (which is 80% Roman Catholic) that people are reporting paranormal demon-related activity connected to their rosaries. Pulpit & Pen has been able to substantiate the veracity of the claim of cursed, demonic rosaries. In fact, they’re all cursed. Everywhere. We’ve been able to confirm such through the Scripture, which forbids any physical object from being treated with spiritual significance, under the charge of idolatry (Exodus 20:3-6, Jonah 2:8, 1 John 5:21, Leviticus 19:4). Likewise, to worship false gods (like their idols of Mary, who the Rosary prayer says is the “Holy Queen”) is to worship demons (1 Corinthians 10:20). In fact, even the nature of such repetitious prayers as the rosary is explicitly “heathen” (Matthew 6:7). While whether or not demons can possess inanimate objects is up for debate, we doubt Roman Catholic priests can exorcise them successfully, because Satan does not make a regular practice of casting out Satan (Matthew 12:26).